How Much is my Home Worth in Tallai? The latest real estate figures on August 7, 2017 show that the median price for a 3 bedroom house in Tallai was $605,000. For a 4 bedroom house the median price was $755,000. The median price for a unit was $295,000. There has been 50 houses and 2 units sold this year. The DSR or Demand to Supply Ratio has both houses and units rated as good. This is generally a good sign for investors. Demand for property is greater than the supply. Sellers are usually getting the price they advertise. Property in this area should stay ahead of the national growth average. The 12 month capital growth for houses in Tallai is at 6.45% and for units it is 10.91%. The average annual capital growth for houses is at 5.25% and for units it is 2.32%. House prices and weekly rent returns in Tallai. Are you thinking of selling your home and want to know its market value? Our appraisers deliver free and accurate property appraisals on units and houses. We are located in Tallai and know this area well having sold more than 90 properties. We base valuation on the location to shops and schools. We also factor in the recent sales history. We have a database of investors who are looking for property to buy in Tallai. This can save time in the sales process and also maximise the price you get. Have you just purchased an investment property and you need a property manager? Or, do you want to rent your current home in Tallai? We currently manage multiple rental properties. We can give you a free rental appraisal as to the amount of rent you can expect to get per week. We like to meet with the landlord and establish a relationship. All tenants are security checked prior to any lease agreement. We use the latest software to arrange routine inspections, maintenance issues and payment receipts. Our job is to maximise your return on investment. 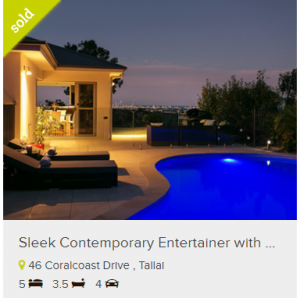 Browse our list of recently sold homes in Tallai. Our sold properties include houses, units apartments and land. there are 44 properties available with your search results.